Tab key auto-completion is a feature that many command line users are familiar with, particularly those with a unix and linux background. Of course, the Mac OS X command line features tab completion as well, but much lesser known is that the excellent “Go To Folder” screens of the Mac also support tab completion. 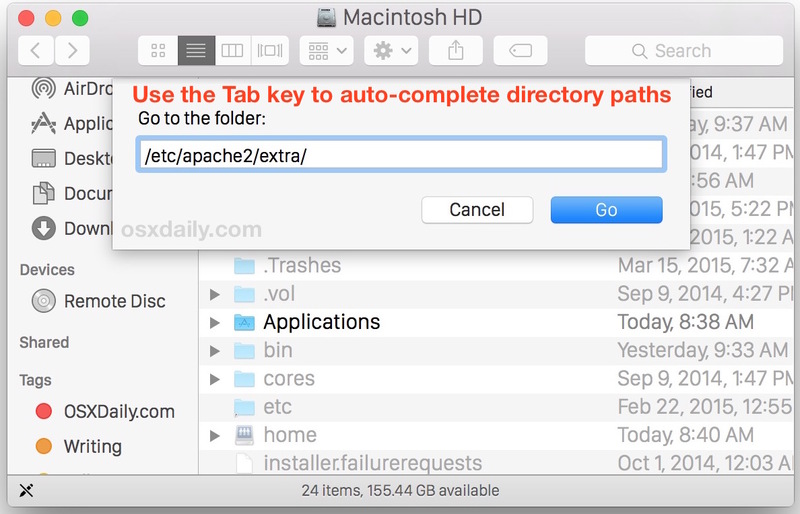 Yes, the very same Go To Folder option that lets you jump anywhere in the Mac OS X file system in a jiffy, also allows for you to start typing out a directory path and use the tab key to finish writing it for you. Stop there, then hit the tab key to complete the rest of “Pre” with “Preferences” – that’s tab completion! This is extremely useful when you are accessing lengthy paths in your filesystem. Auto-completion should be familiar to anyone with a unix background, since it is regularly used within the command line interface. It works basically the exact same way here, and is supported in nearly all versions of Mac OS X regardless of origin date. You can use the tab key to autocomplete any path in the Finder Go To Folder window, so whether you’re trying to navigate to a local user directory, or some deeply embedded path in the file system, tab it out! but before I could hit the Tab key, OS X had already completed the path. Upon further testing with different and longer paths, OS X completed every path I started to type with no intervention from me. I’m not really surprised by this functionality, nor am I surprised by the fact that Finder auto-completes the path. I’v never used go to folder in Finder though, contrary to tab completion in terminal which I use daily. while Preferences/ and PreferencePanes/ is also available. This won’t happen in terminal, either it adds nothing or it shows the available options if you press TAB twice.